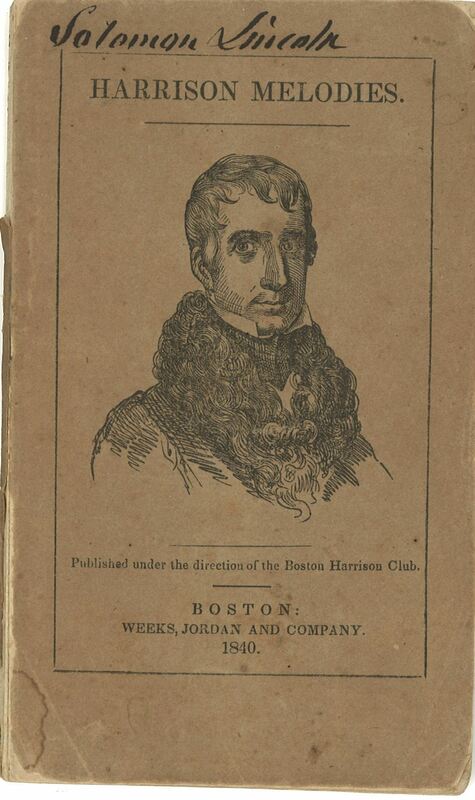 Solomon Lincoln’s copy of “Harrison Melodies.” Lincoln, a lawyer and banker, was active in Hingham politics. We recently blogged about Jairus Lincoln’s 1843 “Anti-Slavery Melodies”—an anthology of songs to sing at abolition rallies (see The Songs of the Abolitionists). 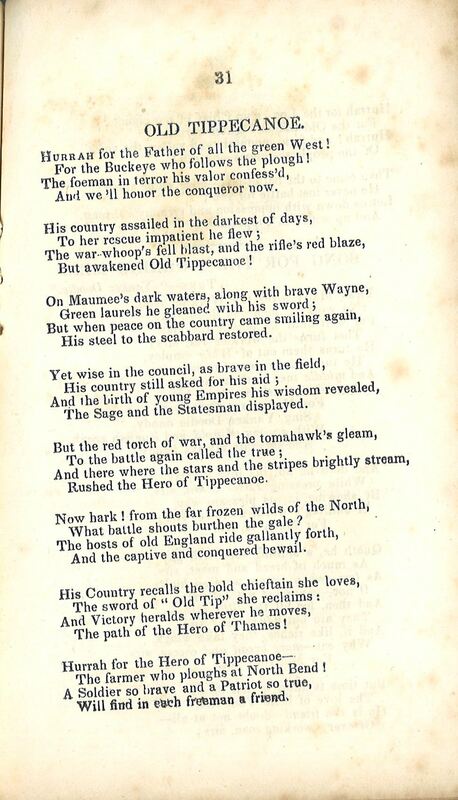 We were delighted to learn that the political singing did not end there, having recently discovered in our archives a second political songbook, only three years older, published by local supporters of William Henry Harrison during the 1840 Presidential election campaign. This compilation of the lyrics of seventy pro-Harrison songs, the authors explained, filled a pressing need: “The want of such a compilation has been for some time sensibly felt at . . . ‘Whig gatherings’” around Boston. The Whig party was born out of opposition to Andrew Jackson’s Democratic party. The ‘Age of Jackson” and “Jacksonian democracy” were built on increasingly broad white male suffrage as states eliminated poll taxes and property ownership requirements that once limited the vote to wealthier men. Long before Abraham Lincoln, Andrew Jackson was famously born in a log cabin. Jackson’s veto of a bill renewing the charter of the Second Bank of the United States divided Eastern mercantile interests and western farmers, debt-ridden in a tough economy. Not surprisingly, Hingham was “Whig” country: in their Hingham history Not All Is Lost, Russell and Lorena Hart report that Andrew Jackson won only 28 votes from Hingham during his first Presidential run and 32 votes as the incumbent four years later. “Old Tippecanoe.” The campaign slogan “Tippecanoe and Tyler too” is still remembered. William Henry Harrison (1773-1841) was the Whig candidate for President in 1840. He had gained national fame defeating Native American forces at the 1811 Battle of Tippecanoe, served as the first territorial delegate to the U.S. Congress from the Northwest Territory, and was later elected congressman from the new State of Ohio. Taking a page from Andrew Jackson’s book (although he had been raised in a wealthy Virginia family), Harrison ran for President as a war hero and a man of the people. His supporters impugned his opponent, incumbent President and Democratic candidate Martin van Buren, as a New Yorker and wealthy elitist. The Democrats in turn ridiculed Harrison as old and provincial, suggesting that he was most fit to sit in his log cabin, drinking hard cider. Harrison and as his vice-presidential candidate John Tyler seized upon these symbols, using images of log cabins and cider jugs in their campaign. 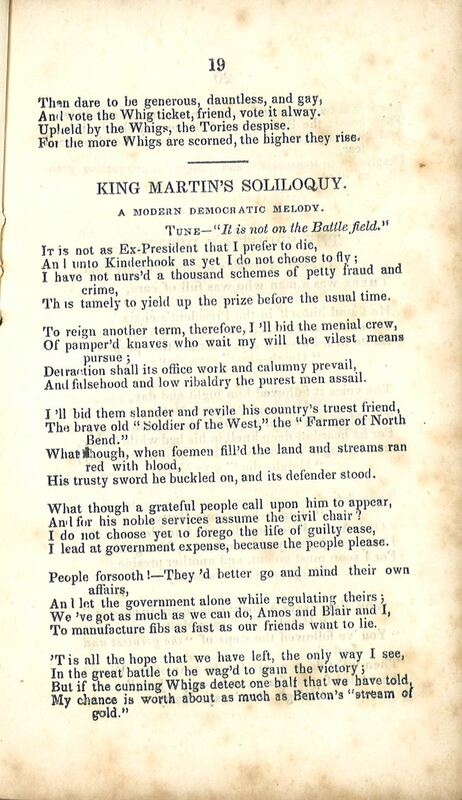 “King Martin’s Soliloquy.” The Whigs chose the name of their party from that of the 18th century opponents of King George III. William Henry Harrison was elected President in 1840. The Whigs’ joy was short-lived, however. Harrison died after only a month in office. This entry was posted in Uncategorized and tagged Lincoln family, music, politics, Whigs, William Henry Harrison.